This newest colorway of Luke Chueh’s awesome Dissected Bear Head will be dropping this weekend at the inaugural Five Points Festival in New York! 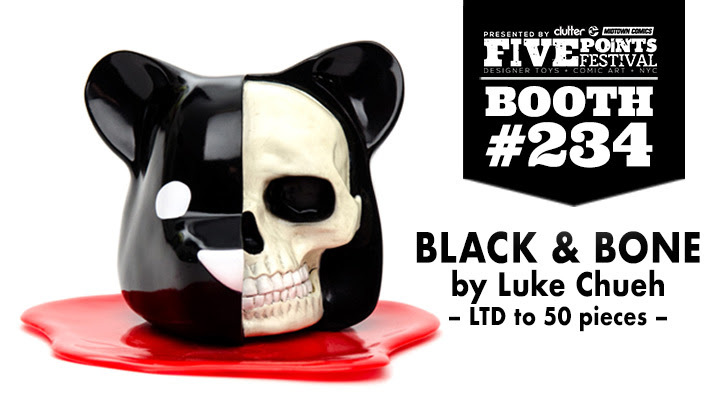 Produced by Clutter, the Five Points Festival Exclusive Black and Bone Edition Dissected Bear Head features a killer black, white and bone color scheme sitting on a convention exclusive vinyl blood pool. Limited to just 50 pieces, this Five Points Festival release measures 6”×6”×5½” and will retail for $100 at Clutter’s FPF booth #234.